OXFORD, Miss. 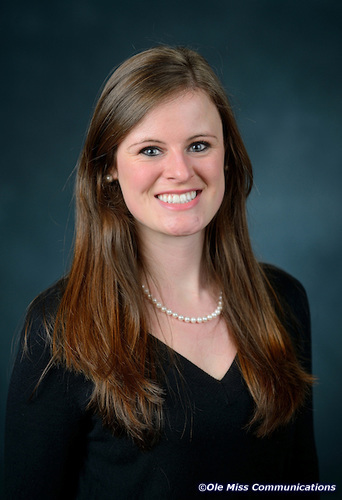 – Alix Cawthon, a second-year pharmacy student at the University of Mississippi, is the winner of a Kappa Epsilon Zada M. Cooper Scholarship. Kappa Epsilon is a professional pharmacy fraternity founded in 1921 with the mission to serve women pharmacists, and now champions women’s health issues. The fraternity’s foundation promotes scholastic and professional advancement among its members with awards, fellowships and scholarships such as the Zada M. Cooper Scholarship, a $750 award given to five students each year. Cawthon became a member of the UM chapter of Kappa Epsilon as a sophomore in the Early Entry pharmacy program. After a year, she became the organization’s secretary and now serves as the Kappa Epsilon president. Cawthon, an Abita Springs, Louisiana, native, plans to complete at least one year in a hospital residency program upon completing her Pharm.D., where she hopes to specialize in infectious diseases. “Receiving this national scholarship will hopefully give me a leg up in the residency application process, and, of course, it also helps alleviate the burden of student loans,” Cawthon said. Cawthon spent an extensive amount of time on the scholarship application, which required several essays about her career goals and how she will contribute to Kappa Epsilon in the future. Kappa Epsilon presented the Zada M. Cooper Scholarships at the American Pharmacists Association annual meeting and exposition on March 25 in San Francisco.